"About to launch in howling gale? 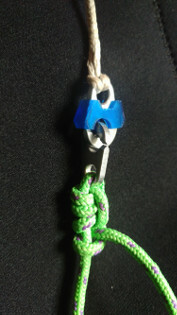 Brummel Hooks are bound to fail!" Reliable safeguard against self opening Brummel hook connections. Brummellocks are made from a flexible but very tough material making them virtually unbreakable. 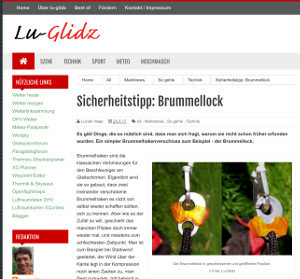 Brummellocks can be installed without the need to detach the Brummel hooks first. Simply slip the Brummellock with the narrow end over the Brummel hook from your riser or harness (and be aware of the offset hole). When the Brummellock is closed, the slot in the hook is blocked by the Brummellock and can't open by itself. One set consists of two Brummellocks compatible with the Brummel hooks from Finsterwalder&Charly (Nova, Advance, Skywalk and many others). <-- Before ordering, please compare the Brummel hooks on your risers or harness with this picture, one of them must match! The green Brummellocks are daylight fluorescent and remind you to connect the brummel hooks. 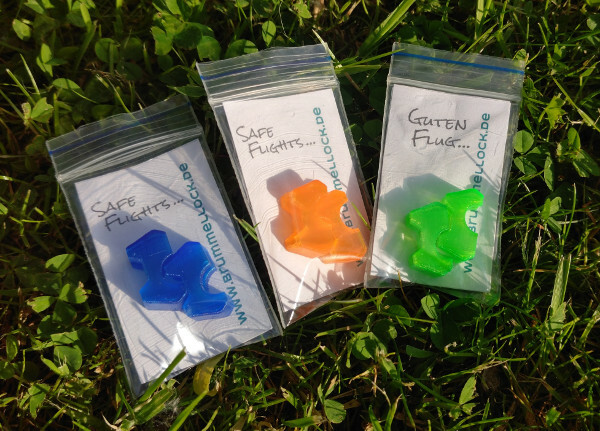 One set costs 7,- EUR plus 2,- EUR international shipping. Order amounts can be changed on the following page.